The interesting stuff that wiled away my time this week. Don’t blame me for your procrastination – I have enough trouble of my own!! Sherry and Michaela kicked off the second annual MeetPlanGo event this week and by all accounts this year was even better than last year! With several friends taking part, hosting and being panel members, I just know that those soon-to-be travelers who attended are plotting their way out of their cubicles this weekend! Sherry wrote a post about choices and shows just how affordable travel can be. Watch their space for more information on how you can chuck the cubicle. This British Airways ad takes us on a journey across time and relives the original mystery and awe of being able to fly. Matt wrote some excellent tips on visiting Berlin. It’s a city that I definitely could see myself living in. I find it intriguing on so many levels; it seems to be looking backward and forward at the same time and has distinct neighborhoods to visit. Thinking about travelling the world? This BootsnAll post should give you everything you need. I’m pretty sure it’ll take you all week just to get through this gigantic resource. This Globe and Mail article about sea kayaking reminded me of a book I read last year. 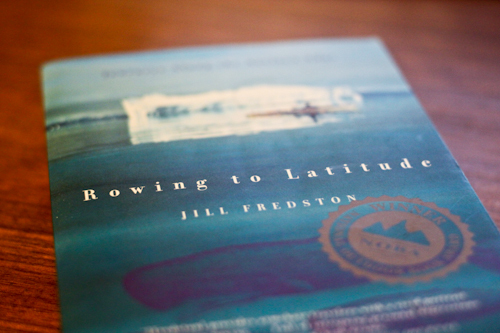 Rowing To Latitude is a sometimes hair-raising account of the author, Jill Fredston, and her husbands years of cold water sea kayaking in the far north. Their drive for adventure and the unknown is unparalleled as they enter into journeys that they know may not be enjoyable but will give them the sense of accomplishment they crave. Giveaway!!! I really enjoyed the book and I want you to too! I’ll give away my copy of Rowing To Latitude to a random reader next Friday. All you have to do is Like the OneGiantStep Facebook page; just head on over and click Like. That’s it. I’ll draw a random name next Thursday evening and let you know the winner on the next Friday Fodder. Good luck!! ← Learning About Very. Slow. Travel. I already have “liked” you guys on FB, since we kayaked with you in Laos do I get an extra entry? Looks like a great book. Have a good weekend.